This class is for fourth and fifth grade students, based on public school age guidelines. The 4/5 program meets twice a week on Tues and Thurs from 9:00-4:00. We will continue with our All About Spelling curriculum learning about many important spelling rules. We’ll continue cursive writing instruction and keep a copybook with poems. In addition to spelling and grammar we’ll enjoy a variety of creative writing exercises and keep a daily writing journal. Students will strengthen their grammar skills including diagramming through in class activities and home assignments. Students will also learn the six traits needed for successful writing including content, organization, voice, word choice, sentence fluency, and conventions. Math: Saxon Math, supplemented with other activities. 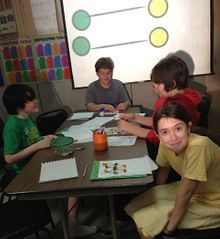 All students are placed in Math based on their math ability level. A placement test is given the first week of class. This hands-on class will explore key concepts in physical science. Children will learn about motion, force, and energy; electricity and magnetism; and sound and light through experiments, model building and creative projects. This class will cover history chronologically beginning with the Fall of Rome and continuing through Christopher Columbus and the discovery of America. We will explore important historical figures and artists of the Renaissance, learn about Henry the VIII's wives, and discover the events that led to the Protestant Reformation. Finally we will learn about famous explorers including Magellan and Henry the Navigator. Text is the Story of the World Volume 2, we covered the first half of this book last year. Students may choose either a recorder ensemble or a beginning band class. The children will learn about the life and artistic style of many of the world's famous artist. 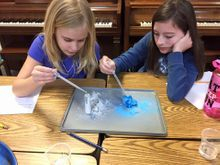 Hands-on activities using a variety of mediums will help reinforce concepts learned. Our Spanish Enrichment classes will introduce the Spanish language and Latin American/Spanish cultures in a “fun” atmosphere. There will be a variety of activities including flashcards, videos, games, and songs. We will build on our previous instruction and start learning additional grammar and vocabulary . The skill level taught will vary with the age of the student. Our goal will be to build a strong language foundation while having lots of fun!